Live. Employee engagement is an experience to be lived not a problem to be solved. One for all, all for one. Employee engagement is everybody’s business – we are each responsible for our own engagement and each accountable to everyone else for their engagement. Engagement Anonymous. Anonymity is for self-help groups – we need to put a name and face to engagement while bringing an end to reliance on anonymous engagement surveys and anonymous 360 degree feedback. Not a measured response. We focus too much on surveys and measurement and need to focus more on meaning and movement. Impermanence. Employee engagement is impermanent. It is not a yearly measure on a survey but a fluctuating dynamic connection to our work, our organizations, and others. Engagement IS the new management. Employee engagement IS management and leadership not an extra of management or leadership. Engagement is the counterpoint to the antiquated command and control management as we significantly shift our relationships to work, results, and each other. Community trumps organization. Employee engagement is demanding that organizations become authentic communities – anything less is anemic and ineffectual. Them is Us. Presidents, Executive Members, Directors, Managers are employees too (they seem blind to this at times) and we cannot refer to employees as “them” because them is us. Shift our thinking. CEOs need to think like all employees – all employees need to think like CEO’s. Bidirectional engagement. Employee engagement is bidirectional and requires employees to engage with their work and organizations while organizations engage with employees and their development. Practice the art of love. Employee engagement is a human endeavor requiring: respect, trust, caring, empathy, focus, and even love – not mushy naive love but the powerful love Erich Fromm articulated requiring discipline, concentration, and patience in the service of our work and others. Recognition, invitation, conversation, co-creation. Employee engagement is not a new way to dress up motivation rather it refers to how the workplace will demand authentic recognition, genuine invitation, engaging conversation, and robust co-creation. Get connected. 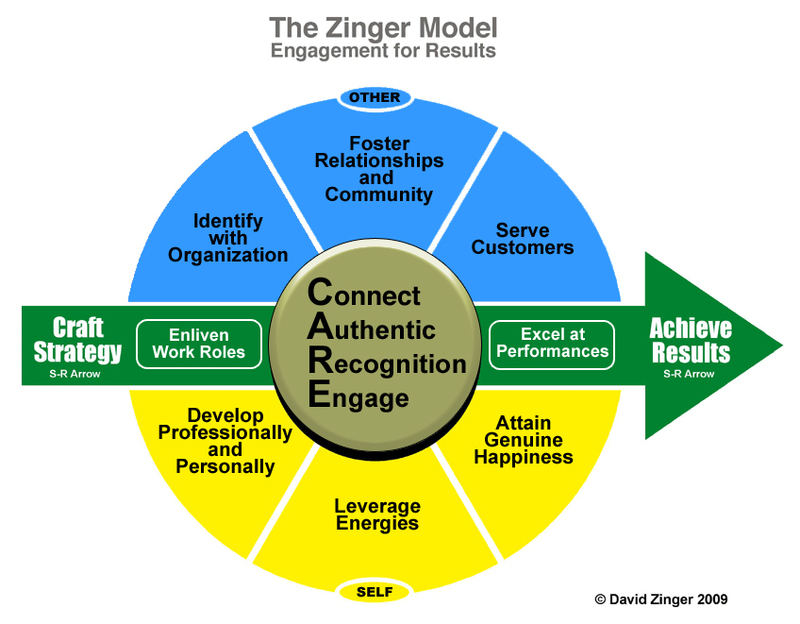 Engagement needs to fuse multiple connections of all employees to results, strategy, roles and functions, organization, community and relationships, customers, personal and professional development, energy mastery, and happiness. Coming and going. The raw material of engagement is mental, emotional, physical, spiritual, and organizational energy. Renewed energy is also the dividend we receive by engaging in our work. Verb. Employee engagement is not a noun, it is a verb – engage now.